Official Summary: In the 1960s, Jerry Waxler, along with millions of his peers, attempted to find truth by rebelling against everything. After a lifetime of learning about himself and the world, he now finds himself in the middle of another social revolution. In the twenty-first century, increasing numbers of us are searching for truth by finding our stories. In Memoir Revolution, Waxler shows how memoirs link us to the ancient, pervasive system of thought called The Story. By translating our lives into this form, we reveal the meaning and purpose that eludes us when we view ourselves through the lens of memory. And when we share these stories, we create mutual understanding, as well. By exploring the cultural roots of this literary trend, based on an extensive list of memoirs and other book, Waxler makes the Memoir Revolution seem like an inevitable answer to questions about our psychological, social and spiritual well-being. Whether you are a reader, a writer, or a journaler, or story teller you will find Memoir Revolution to be a worthwhile read. There’s definitely a story going on, but Waxler takes the role of teacher. I hesitate to refer to Memoir Revolution as “text book like”…so I would describe the experience of reading it as follows: It’s like getting to know a highly admired college professor and then being invited to his home for a study group and then you get there and there’s wine, snacks, fabulous coffee, and great conversation. You have an opportunity to learn something in an environment so comfortable you never want to leave. Waxler has interesting insight into the reasons memoir has become so popular in recent years. He shares his insights as well as his personal stories and struggles. His openness and style is unique and respectable. I was not disappointed with Memoir Revolution and would recommend it to those considering writing their own stories, those who enjoy reading memoir, and anyone who has found it therapeutic to put their own stories to words. For more information about Waxler and his work, please visit his website: Memory Writers Network. I am hoping he will be touring with WOW! later this year. If you would be interested in participating in his tour or a tour for other memoirists such as Paige Strickland, Kathleen Pooler, or Tara Meissner, please contact me via email at: crystal@wow-womenonwriting.com and thank you in advance for your support of WOW! and our touring authors! Jerry's blog posts are always so eloquent and insightful--I'm not surprised to hear his book contains much of that same writing! Memoirs fascinate me, although I'm a little too scared to delve into writing one myself at this point in my life. 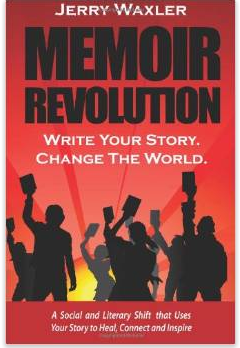 Thanks so much for enjoying and reviewing Memoir Revolution. Many of us are pulled to shape our lives into stories, but putting them on the Internet is like a raindrop falling in a storm. Thanks to your work with bloggers, we writers have a chance to make a bigger splash. You apparently have overcome some of your fear already! I love your post about the ten things people don't know about you. That's a perfect start. Write a few scenes to go with each one - a scene of walking into a room, a scene of hanging out with friends, and so on. Then put the scenes in chronological order. At first, you might not have an understanding of beginning, middle and end, or where you want to take the reader. Keep crafting. Over time, the structure emerges from the evolving manuscript. It's like sculpting a narrative from the raw material of your memory. And you can generate a lot of interesting short stories along the way. Have fun!